For decades, Tom Peters has been preaching the gospel of putting people first, and in today's rapidly changing business environment, this message is more important than ever. Gallup numbers show that fewer than one-third of employees feel engaged with their work, and one study suggests that fully half of American jobs are at risk due to technology. AI's reach is even beginning to encroach on those in the professions—doctors, lawyers, and engineers. In short, this affects 100 percent of us now. The Excellence Dividend stems from a simple proposition that an unabashed commitment to excellence in all we do is the best defense—and offense—in the face of overwhelming change. Peters shows that nothing beats a high-quality product or service, designed and delivered by people who are as dedicated to one another as they are to their shared goal. With his unparalleled expertise and inimitable charisma, Peters offers brilliantly simple, actionable guidelines for success that any business leader can immediately implement. He provides a road map for your organization and for you as an individual to thrive amid the tech tsunami, and he has a lot of fun doing it. The Excellence Dividend is an important book from one of today's greatest business thinkers. Since I was very young I was passionate about business and entrepreneurship. In 1985 I was twelve years old when my father gave me my first Tom Peters book. It began a journey with this man, whom I have never met, but have studied and admired from afar all these years. As I got older I realized that twenty-five years before anyone was taking seriously the soft side of business and its impact on excellence and success, Mr. Peters was pioneering the essential thought surrounding employee engagement and a dozen other topics that are popular today. The future of corporate training belongs to those who realize that if you teach people things in a way that applies to both their personal life and professional life, retention will be ten-fold. Mr. Peters worked this out decades ago. Read The Excellence Dividend with that in mind and you will see what I mean. It is genius. My only other advice is when you are done, order a copy of everything he has ever written. I’d rather hire someone who has studied his writings than someone who has an MBA. Wherever there is huge success you usually find a few copy cats, but this has never happened in Mr. Peters' case. Most business authors, speakers, consultants have about ten pages of good stuff which they expand into a hundred and eighty pages to make it look like a book. As you read and study Mr. Peters, you realize every chapter could have been a book unto itself, and at times you come across a paragraph and think, 'Wow, that idea would make a great book.' But he gave it to you in one paragraph. 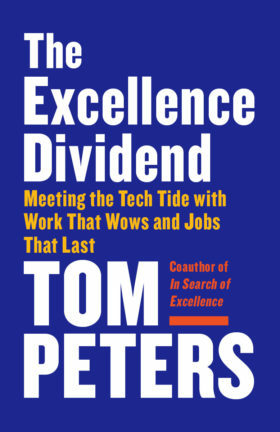 Half-part swan song, half coda to Tom Peters’ career spent perceptively examining the dusty corners of business management-turned-leadership, and publishing his conclusions, The Excellence Dividend, brings us the curtain call of one of the grand-daddies of the leadership literature.